Clothes moths larva (caterpillar) stage damages items of animal origin, such as wool, fur, silk and feathers. The adult moths do not feed. They are rarely seen because they tend to hide in the dark during daylight. The Indian meal moth, a common “pantry pest,” flies about during daylight and is often mistaken for one of these moths. 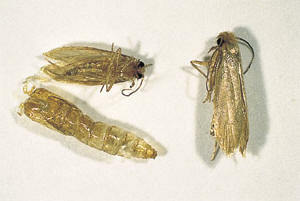 The Casemaking clothes moth, is a buff gray color and approximately 1/4-inch long with its wings folded along the body. Each front wing has three somewhat indistinct darker spots of scales. The larva is creamy white with a brown head. It produces a silken tube-like case in which it lives and carries around for protection. 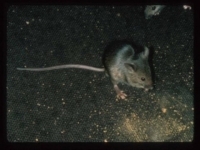 The head and legs are exposed only during feeding and movement. This case is camouflaged with bits of the material on which the larva has been feeding. The larva is approximately 1/2-inch long at maturity. Development from egg to adult is highly variable, depending upon available food and environmental conditions. It may be as little as a month. The webbing clothes moth is a uniform buff color, approximately 1/4-inch long. 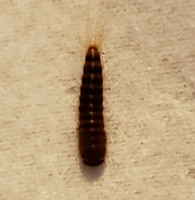 It has a small tuft of red hair on the top of its head. The larva is whitish colored with a brown head. It produces a silk-lined “tunnel” as it eats through or on the surface of a fabric. The moth is approximately 1/2-inch long at maturity. Its developmental time is very similar to that of the casemaking clothes moth. Conduct a regular inspection program of all susceptible items at least once a year. Take all items out of closets and drawers, and vacuum closets and drawers thoroughly to remove lint on which larvae may feed. When making purchases, look for woolens and wool synthetic blends that have been treated by the manufacturer with a moth-resistant compound. Clean garments regularly. Thoroughly clean garments before storage. Clothes moths are attracted to articles soiled by food, beverages, perspiration and urine, rather than the clean wool itself. For furs, professional cleaning and cold storage is recommended. Store articles properly. Place clean articles in tight storage containers. Good plastic bags (without holes) sealed after the clean item is placed inside should prevent clothes moth infestation as long as the bag remains without punctures or tears. Use storage containers with tight fitting lids and seal storage containers or cartons with a good quality tape. All seams and joints should be taped over. If garments are completely clean when placed in sealed containers, they should be safe from clothes moths. Note: Cedar chests are good pest-proof containers primarily because of their tight construction, and not the fact that they may release cedar oil. 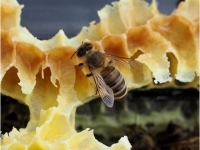 Cedar oil can kill young larvae, but may not affect older ones. Also, as the wood ages, the oils are not as volatile. Light sanding can help release the oils after a year or two of use. Place garments in cold storage where temperatures remain below 40°F. Larvae are inactive at temperatures below 40°F. Many people assume that freezing temperatures will control these insects-not always so. 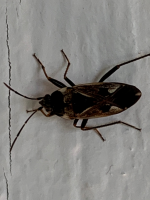 Clothes moths have survived for long periods in unheated attics and barns in old furniture, clothing and blankets exposed to below-freezing temperatures. Although lower temperatures slow down or put a temporary halt to their activities, the clothes moths are usually not directly killed by them. If you have infested articles, you can often rid them of larvae and eggs by brushing and sunning them, or by having them dry cleaned. Vigorous brushing outdoors in bright sunshine, particularly of areas around cuffs, collars and other hidden places, if done periodically, can be effective in destroying clothes moths. 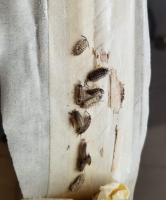 If pillows, mattresses, or upholstered furnishings are infested, you may want to have them treated by a professional pest control firm, or dispose of the infested articles. Moth proofing after cleaning or sunning can help prevent future infestations. Many commercial cleaners offer a moth proofing process. Infested cabinets or closets should be vacuumed thoroughly to remove any wool lint from between boards or in corners. 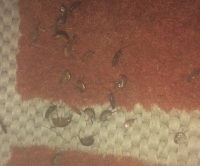 If you have a widespread infestation, it is advisable to enlist the services of a professional pest control firm.